Our journey begins by crossing the historic Brooklyn Bridge from Manhattan. Learn about the 14-year epic saga of the great engineering achievement of the 19th century that connected the “twin cities” of Brooklyn and New York. We’ll continue in DUMBO where you’ll discover how an antiquated warehouse and factory district was transformed into a prime residential, cultural, and retail/commercial/tech center that businesses like Etsy, Jacques Torres, and West Elm call home. 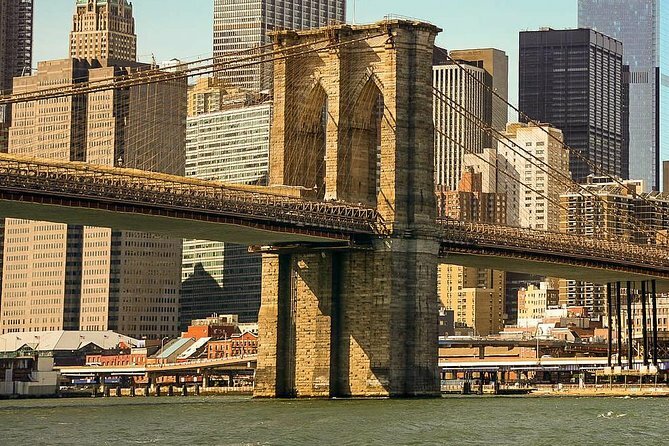 As we progress through the Brooklyn tour you’ll see the stunning Brooklyn Bridge Park, you’ll see awe-inspiring views from below the Brooklyn and Manhattan Bridge, plus a perfectly restored 1922 carousel revolving within a “crystal” box. We’ll explore Brooklyn Heights, New York City’s first suburb and historic district, with spectacular views of Manhattan from the Promenade. We’ll stand near where George Washington conducted a maritime retreat that saved American independence during the Revolutionary War and where Robert Fulton ran his steamboat ferries to and from the Brooklyn suburbs. Discover dozens of elegant pre-Civil War homes and hear the stories of famous residents such as Truman Capote, Norman Mailer and Arthur Miller. See a house from the movie “Moonstruck,” and discover the 1847 church visited by Abraham Lincoln and led by the most famous preacher in America. Experience the cultural and historical phenomenon that is Brooklyn on this walking tour. Reserve your place by joining the “Brooklyn Revolution” tour today! • Learn the history, design engineering accomplishment that is the Brooklyn Bridge. See historic images and photos. 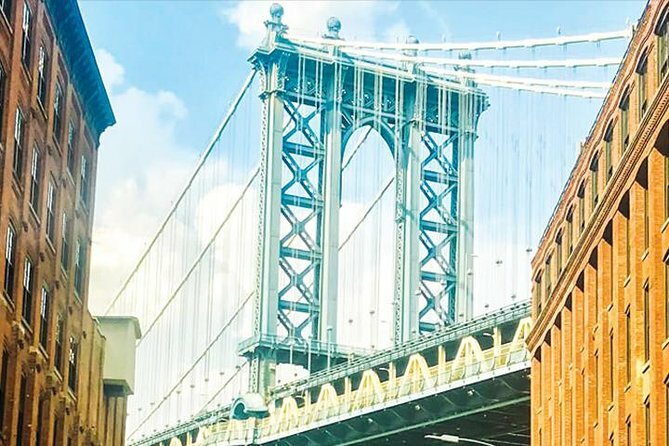 • Walk through the DUMBO neighborhood and experience the transformation of a factory and warehouse district to offices and homes. • Take in views of the old converted piers to the 85 acre Brooklyn Bridge Park. • Visit historic locations involving George Washington and the Revolutionary War. • Visit the historic district that is Brooklyn Heights and the tranquil tree-lined streets of hundreds of 19th Century houses. • Learn about literary residents such as Truman Capote and Norman Mailer. • Visit a historic 19th Century church visited by Abraham Lincoln and led by a famous minister. • See sites of famous movies such as Moonstruck…and a whole lot more! Led by licensed New York City tour guide Bruce Racond, who has spent more than 20 years entertaining and educating visitors on the vast history and showing the unique locations of New York. We generally walk over the entire Brooklyn Bridge from Manhattan to Brooklyn. We walk through much of DUMBO on the tour. We walk along some of the Brooklyn Heights Promenade on the tour. We walk through a number of blocks in Brooklyn Heights on the tour. We discover the importance of Henry Ward Beecher and Plymouth Church of the Pilgrims on the tour. We do NOT go inside on the tour. We walk through some of Brooklyn Bridge Park on the tour. Plus we see it from above. If you find a better price, we'll match it - just send the details to support@placepass.com. Tours go out in rain, snow and shine so there are no cancellations or rescheduling for rain or snow within 24 hours of the start of the tour. Please arrive 10 minutes early to check in. Once the tour leaves it is very difficult to find the group on the Brooklyn Bridge. The TOUR BEGINS IN MANHATTAN near the entrance to the Brooklyn Bridge and the TOUR ENDS IN BROOKLYN. The closest subway to the end of the tour is the A, C High Street station. The 2, 3 Clark Street station is within walking distance. Please check the MTA.info website for subway closures and service restrictions. Tour meets in Manhattan at the Tweed Courthouse at 52 Chambers Street. The tour is approximately 2.5 miles and takes about 2.5 hours. The walk is of moderate difficulty as there are inclined walkways/sidewalks on the Brooklyn Bridge and along the tour. As the tour is outdoors, check the weather forecast for appropriate clothing. There are no food or drinks included on the tour. Tour is non-refundable or exchangeable after the standard cancellation policy. DO NOT BE LATE. It is VERY difficult to find the group once it leaves the meeting point. You can cancel for a full refund up to 72 hours before the start of your experience. If you do not show up for the experience or fail to cancel at least 72 hours in advance, you will not receive a refund.